It’s happened to all of us before — you’re out and about, having a fabulous time with your friends, when… oh no! All of a sudden you realize there’s a huge hole in your brand new top, or worse — your favorite pair of pants! No need to panic, though. Here’s what to do if you ever find yourself in a similar predicament. Once you see that there’s a rip, tear or any sort of hole in your pants or shirt, remove the garment and turn it inside out, advises Jennifer Dayan, founder of online shopping destination I Found A Secret. Obviously this is easy to do if you’re at home, but if you’re in public and happen to have all the right tools on you (a needle and some matching thread mostly), head on over to the bathroom and set up shop. Have no clue where to find a needle and some matching thread in an emergency? “I always carry my tiny Minimergency Kit with over 16 must-haves in my bag,” says Jennifer. 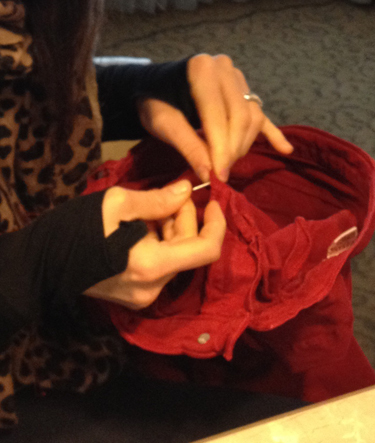 “Locate the hole on your garment, and pinch together the fabric where the rip is so that the opening meets the seam,” says Jennifer. Leave a little bit of room — about half an inch — so you can hold tight while sewing. 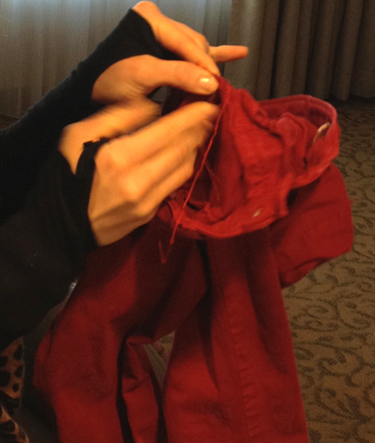 With matching thread, push your needle into the fabric and back out the other end. Continue doing this until the hole is completely closed up, advises Jennifer. “Use a ruler or chalk to help you maintain a straight line, and try to match the original stitch that was used in the garment.” Finally, once you’re done sewing, tie a knot to keep the thread in place. Voila, all done! Now you can head back to the party.